Around 5:00 pm local time on April 22, scientists at Southern Andean Volcano Observatory in Chile began picking up volcanic earthquakes at the Calbuco volcano. A disturbingly short 60 minutes later, the volcano was in full eruption, producing an impressive column of ash extending to more than 49,000 feet into the sky. 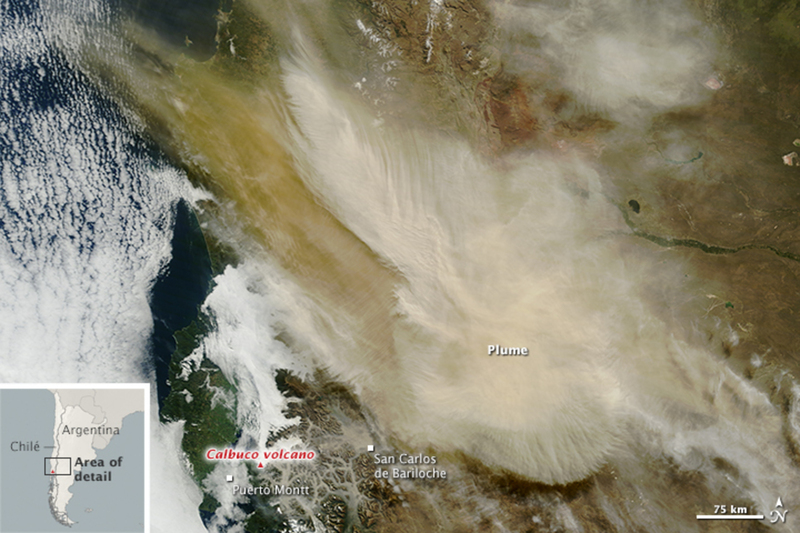 Ash primarily drifted north and northeast of the volcano, covering towns below in a layer of fine ash. Observatory scientists quickly called for an evacuation zone of 12.5 miles. A second explosive eruption began at 1:00 pm local time on April 23 and lasted for at least six hours. During this time an average of 150 earthquakes were recorded per hour. This eruption also produced a similar-sized column of ash, which drifted north, northeast and east of the volcano. My colleague Dr Jeff Johnson, who co-taught a Boise State University geophysics and volcanology course with me at Villarrica volcano just after a March 3 eruption, reports from Pucón, Chile, that the Calbuco ash cloud blocked sunlight and turned morning to night. As of 11 AM, on April 23, Pucón, which is more than 130 miles north of Calbuco, was still covered in darkness. People who live this part of Chile are well-accustomed to volcanoes, yet is still causing widespread concern. As a physical volcanologist, I’ve studied how people who live near volcanoes can deal with the hazards and risks from sudden eruptions as we’re seeing now in Chile. It’s hard to miss the multiple, large, ominous volcanoes that can be seen at any point along the drive from Chile’s capital city Santiago to the south of the country. Many of the volcanoes are remote and in sparsely populated areas, but others are popular tourist destinations for skiing, trekking, horse-back riding and visiting hot springs. Because of frequent volcanic activity in Chile, especially as of late, volcano observatory scientists closely monitor Chilean volcanoes. If a volcano begins to show signs of unrest, such as an increase in shallow earthquakes or ground swelling, observatory scientists go on a 24/7 monitoring schedule. Such was the case prior to the March 3 eruption of Villarrica. However, sometimes, despite careful monitoring, a volcano erupts with no warning at all. An ash cloud rose at least 15 kilometers above the Calbuco volcano, menacing the nearby communities of Puerto Montt, Chile, and San Carlos de Bariloche, Argentina. Calbuco is a 6,570-foot-high volcano located in the Los Lagos region of southern Chile, 20 miles northeast of the town of Puerto Montt. It is one of the most active volcanoes in Chile and is known to erupt explosively. The largest witnessed eruption of Calbuco occurred in 1893, registering an impressive level 4 on the Volcanic Explosivity Index — similar in size to the 1980 eruption of Mount St Helens in Washington state in the US. 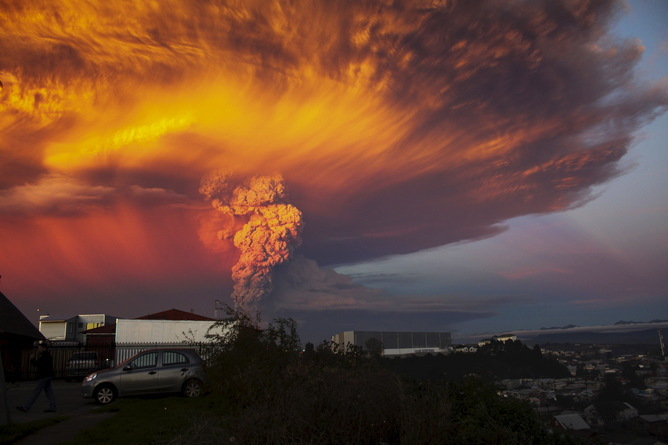 Calbuco has erupted 10 times since, with the most recent eruption occurring unexpectedly on April 22, 2015. Volcanoes typically show signs of unrest for weeks, months and sometimes even years prior to an eruption. Unrest may include a slow inflation, or the swelling of magma in the volcano; increased earthquake activity beneath the volcano; and potentially an increase in the amount and type of gas escaping from the volcano. The only sign of activity from Calbuco was increased gas venting in 1996; since then, it has been quiet. The most serious hazard to towns within the 12.5 mile evacuation zone are lahars – mudflows generated by melted snow and ice mixing with volcanic ash. Lahars are confined to places where water normally drains, but have the capacity to destroy bridges and any other man-made structure in their path. So far at Calbuco, lahars have traveled more than nine miles from the volcano. Lahars are often produced during eruptions, but also can occur long after an eruption has ceased when ash is remobilized by heavy rain. Thus,residents of nearby towns can be displaced for weeks to months depending on the activity, amount of falling ash and climate. The most widely disruptive hazard from this eruption will be the ash fall, which currently has covered regions as far as 165 miles to the north under millimeters of ash. 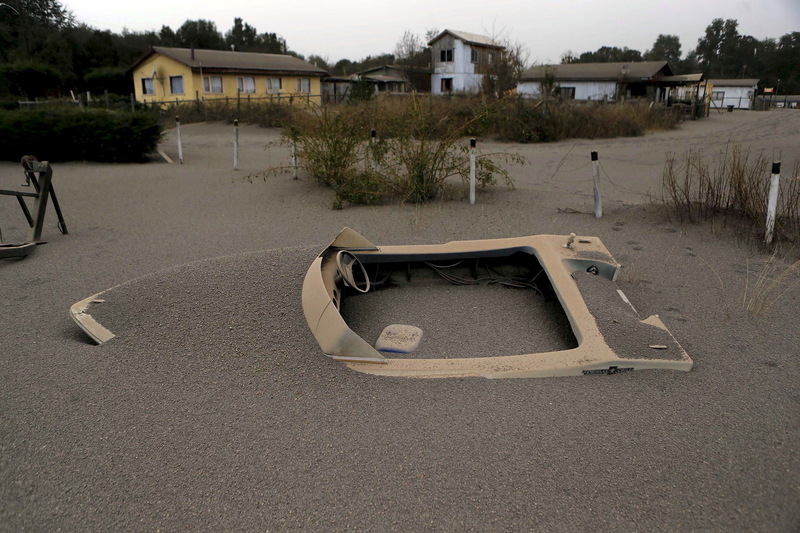 Ash from the Calbuco volcano eruption in Chile has fallen on surrounding towns, including Ensenada, pictured here. Ash presents a health hazard to those with respiratory problems such as asthma. Ash also can result in loss of electricity and severe disruption of transportation. Only one to three millimeters of ash – or about one tenth of an inch or less – can significantly reduce visibility on roadways, and less than one millimeter of ash will shut down an airport. Despite the negative consequences of such an eruption, natural hazards such as this and the March 3 eruption of Villarrica are quite survivable. It comes down to taking a few basic steps to be prepared. Everyone lives at risk from some form of natural hazard, such as wildfires, tornadoes, earthquakes, severe storms and many more. These natural events can knock out power for days at a time and displace loved ones. The people in the towns around Calbuco certainly reported being scared, but their knowledge of evacuation routes and readiness to go at a moment’s notice likely saved many lives. Each of us can rest easier at night by taking a few easy steps to ensure that we also know what to do if disaster strikes in our own backyard, such as preparing food and water for at least three days, getting a first aid kit, and making a plan for contacting loved ones if separated unexpectedly. The preparedness statement from our own Cascade Volcano Observatory sums it up well: Don’t be Scared, Be Prepared. In the meantime, scientists such Dr Johnson and I will continue to research these natural events in an effort to better understand their consequences and better forecast eruptions and volcanic hazards in the future.